The month of Elul being the month that precedes the High Holydays is known as the accounting month, the month of calculating what happened this past year to properly prepare for the upcoming year. A friend explained to me that even though this accounting is very important, it is not something that needs to be daunting, nor does one need to be afraid of it. While he did not use Peter Drucker's quote “If you can’t measure it, you can’t improve it”, I think that sums up what my friend meant. One needs to measure where he is spiritually in order to make an honest calculation. Who am I? Who do I want to be? What is the reality of my spiritual standing? It is only once we make this honest assessment, that we can decide whether where I am is where I want to be or if there is a better place I want to go. If after the final analysis we are where we want to be, great! At a minimum, we come to the holidays knowing where we stand. However, if we are like most people, and we want to be on a higher spiritual plane, then the easy part is to generate this honest spiritual accounting. In the words of Alcoholics Anonymous, “made a searching and fearless moral inventory of ourselves”. Only then can we take the next step, the harder work, of creating a plan of action to improve. Good luck, less then 3 weeks left. Be Wholehearted with the L-rd, your G-d. In his book, Nine and a Half Mystics, reform Rabbi Herbert Weiner recalls a private audience he had with the Lubavitcher Rebbe, in the mid-1950s. In an effort to understand the Chabad movement, he asked a few questions. I found myself taken aback by my own boldness, but the Rebbe showed no resentment. He leaned forward. "What you see missing from their eyes is a kera!" "Yes, a kera," he repeated quietly, "a split." The Rebbe hesitated for a moment. "I hope you will not take offense, but something tells me you don't sleep well at night, and this is not good for 'length of days.' Perhaps if you had been raised wholly in one world or in another, it might be different. But this split is what comes from trying to live in two worlds." One meaning of "Be wholehearted with the L-rd, your G-d" is that when you live with a mission, with a clear objective, a clear purpose, you do not need to fight your evil inclination. To be wholehearted can mean to be focused, purposeful and mindful.d then it will be easier to be with the L-rd, your G-d.
What is your G-dly mission? What world do you choose to live in? What do you do to sleep well at night? P.S. Services are back on :) see you Shabbos Morning at 10:00 am. As we drove from Los Angeles to Sierra Vista, AZ to visit Fraida's sister, we noticed the expanse. The drive is long and the view is open. Lots of sand and much open space. The Baal Shem Tov taught that one should learn something from everything they see and hear. 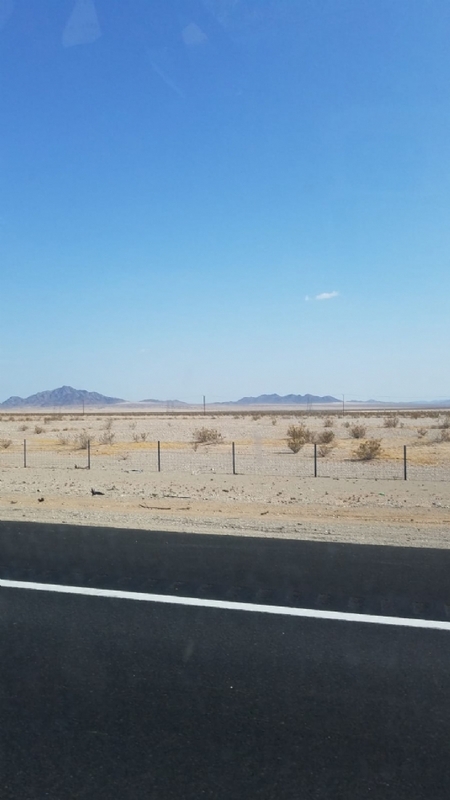 Driving through the desert, the open expanse reminded me of the fact that Hashem makes Himself more available in the month of Elul, when we prepare to meet Him in His "royal chambers" on Rosh Hashana. This Shabbos is "Rosh Chodesh", the beginning of the month of Elul (1 month to High Holidays). Hashem is making Himself available, all we need to do is reach out to Him. What do your High Holiday preparations look like? Regards from California, where we have gone to visit my parents. Over the past few days, seeing how I interact with my father and how my children interact with me, I notice the truth about a verse in this week’s Torah portion. ‘And now, O Israel, what does the Lord, your God, demand of you? Only to be in awe/fear of the Lord.’ (Deut. Ch. 10 v. 12) The sages comment on this verse: Everything is in the hands of heaven, excluding fear of heaven. G-d cannot make us be in awe of Him. Nor respect Him or fear Him. Parents cannot force a child to respect them or treat them with awe. Respect/awe is something that is earned. If we earn the respect of our children, the natural result is that they will be in awe and respect us. We can provide the external factors to facilitate that relationship, just as G-d provides us with health and sustenance, but ultimately the child will make his own choice. What choice do you make in your relationship with Hashem? Are you in awe? Do you have respect for Him? Is it a relationship of fear? Other? It's in your hands. P.S. there are no Shabbos services this week at Chabad.